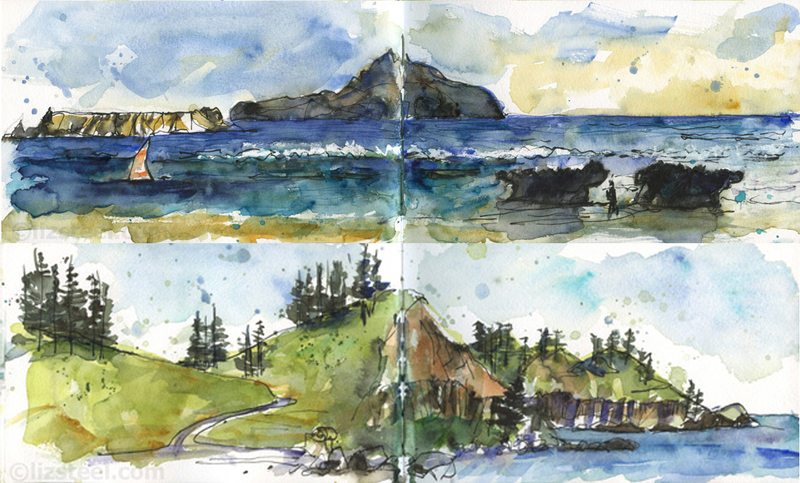 I am just back from a wonderful two week trip to the remote Norfolk Island which is 2.5 hours flight from Sydney and 1.5 hours flight from Auckland. It is a stunningly beautiful island with a fascinating history and the intention of my trip was to have a rest – a true vacation. 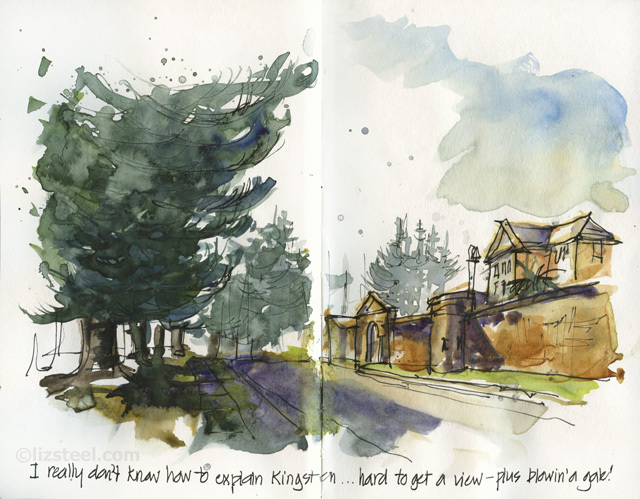 This is something I rarely do these days as most of the time my trips are intensive sketching sessions. But the slow relaxed pace of the island, the lack of exciting tourist attractions and my own limited quota of three sketches per day meant that I only did a fraction of the sketching I would normally do. There are a lot of fascinating things about the island both its history (settled by the descendants of the mutiny on the Bounty) and the unique aspects of island life due to its remoteness but I was rather taken with one small part. The Kingston precinct includes a beautiful beach, a fishing pier, and constantly changing light a collection of historic colonial buildings - what more could a sketcher want? I returned to this area over and over again to sketch different aspects, different views and in different times of the day. Another feature of the island is the native tree, the Norfolk pine tree. 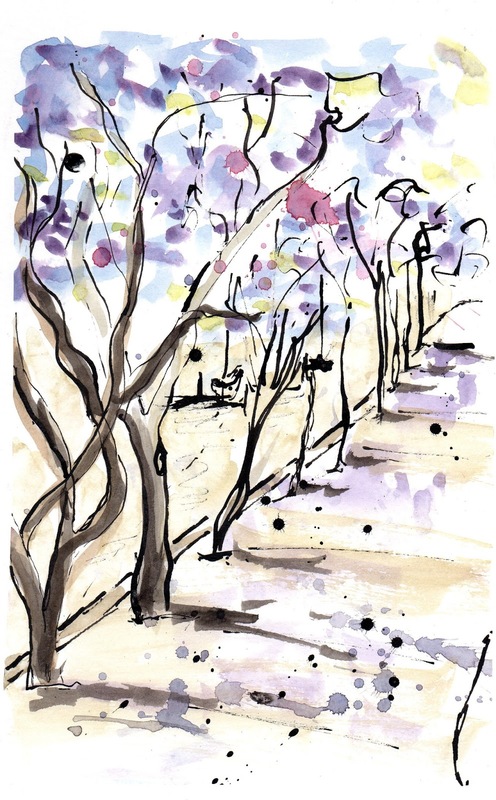 These majestic trees are everywhere and are a major part of the beauty of the island. I don't think I have ever had such a feast of beautiful subject matter from which to sketch. 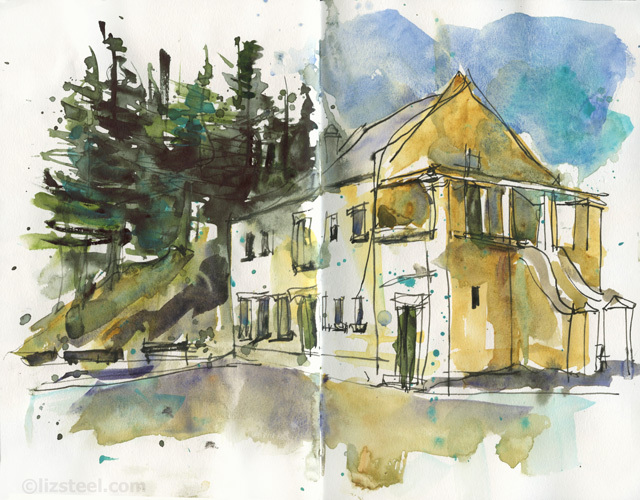 I will just share a few of my sketches here in this post but you can find them all over on my blog. You can also find out a little bit more about the island (including photos) on this post and a little bit about how I enjoyed totally unplugging from social media for the entirety of my trip. 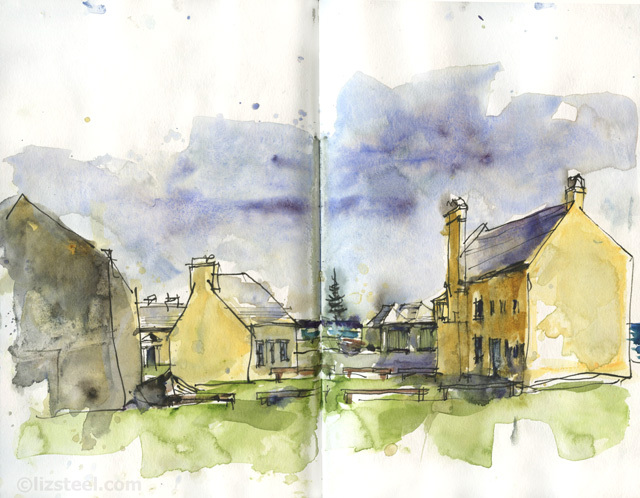 One of the major parts of my trip was the fact that I took an untested sketchbook. 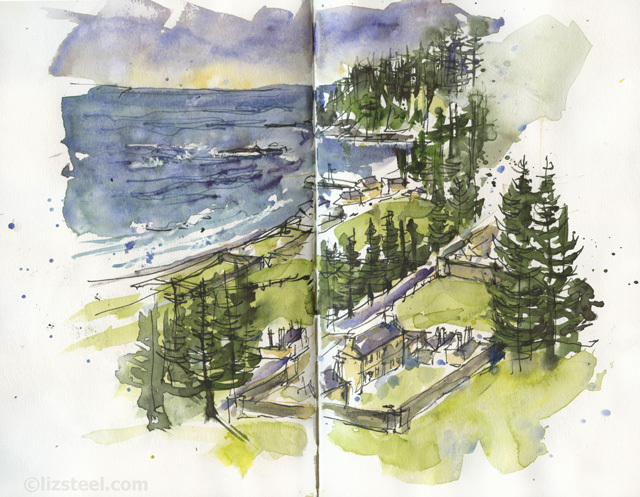 I was given a Pentalic sketchbook by Stephanie Bower and I thought it would be a great occasion to use it. 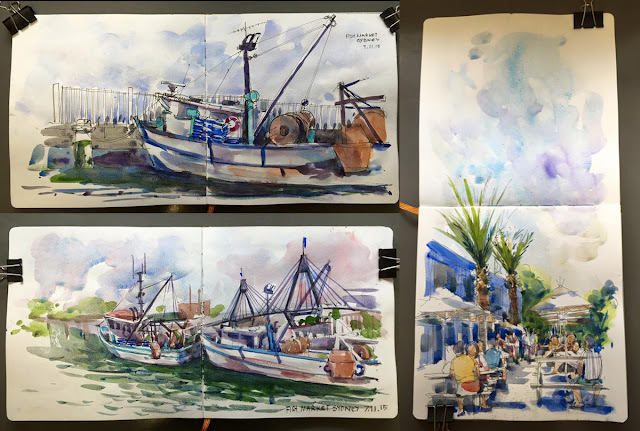 I had a few challenges initially which I described in detail on this post but managed to develop a way of using the book to suit the way I paint. 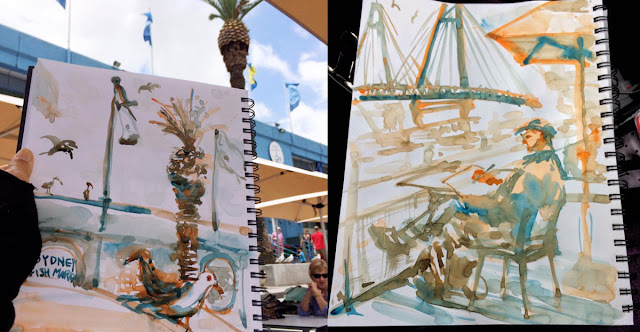 Thankfully I took an emergency sketchbook as well which gave me a chance to do some loose sketches while I worked out how to get the results I wanted in the Pentalic book. I have just done a detailed review comparing the Pentalic paper with the moleskine paper on my blog here. 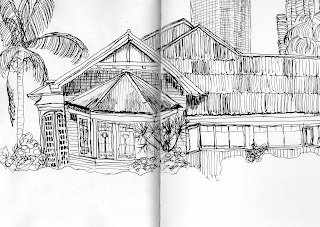 I really got addicted to this particular grouping of buildings around the Kingston Pier area, the space between the buildings was really interesting and I did at least one sketch every day I was in the area. 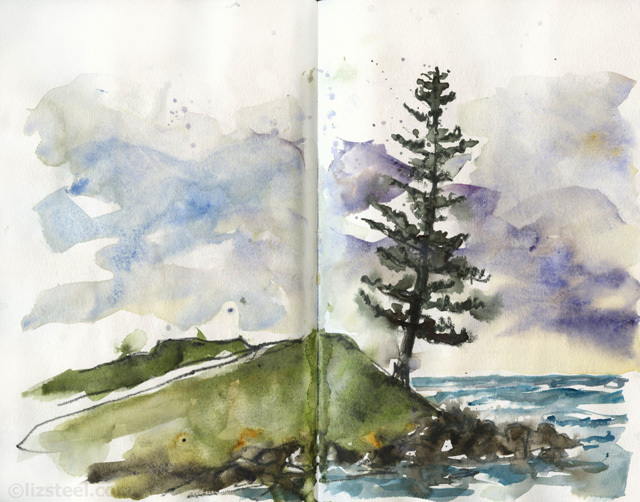 The most famous Norfolk pine tree on the island is referred to as Lone Pine - I think this is a poetic symbol of how this little island supports itself in the middle of the ocean. 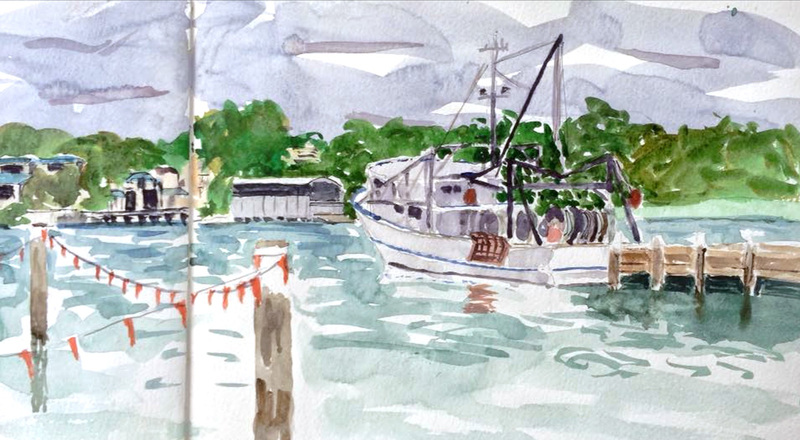 Despite how remote the island is, I am pleased to report that there is one urban sketcher on the island. Bronny from Adelaide moved there year ago so it was great to have someone to hang out with towards the end of my stay. 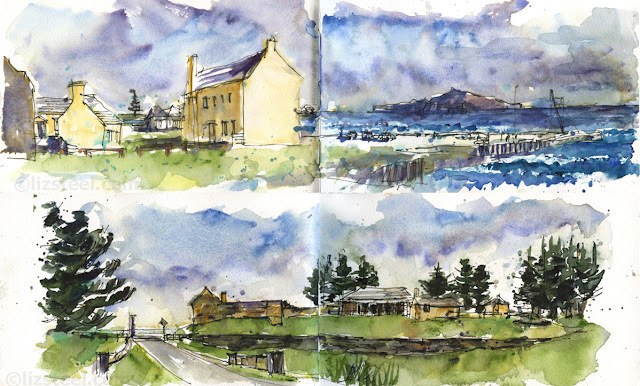 I do hope to return there one day – it would be a great venue for a group sketching trip. 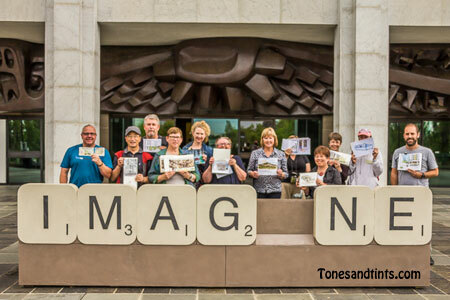 Today the National Gallery of Australia held drawing events associated with The Big Draw. 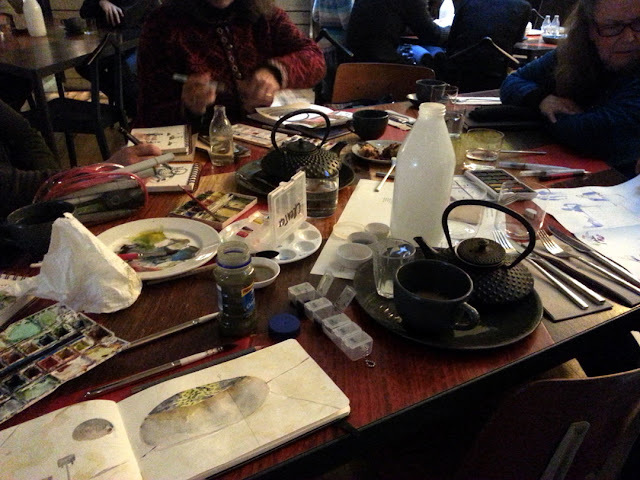 The aim of the festival is promote drawing, so of course, we decided it was a great opportunity for an informal meeting. 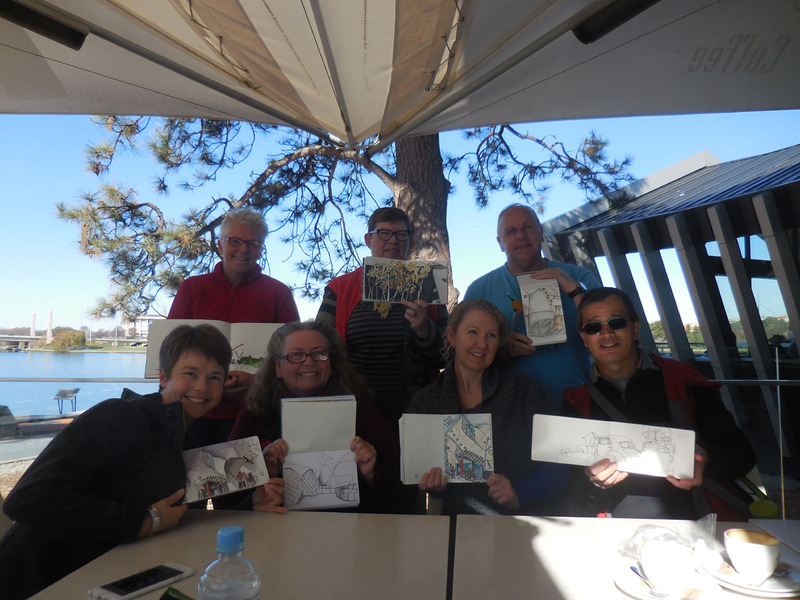 Some of the members of the Canberra Urban Sketchers group decided to go along, join in the activities and have some lunch afterwards. 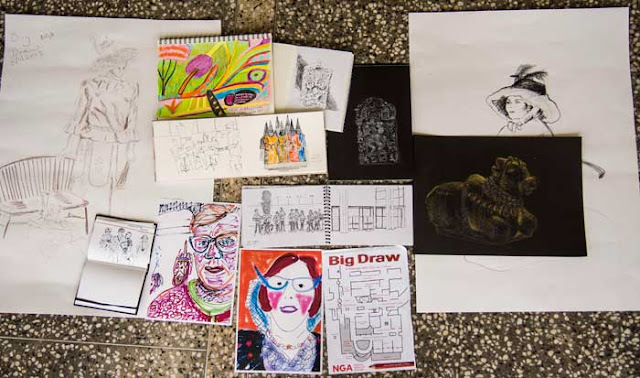 The Big draw is a world wide drawing festival for anyone who loves to draw and welcomes people of all skill levels. 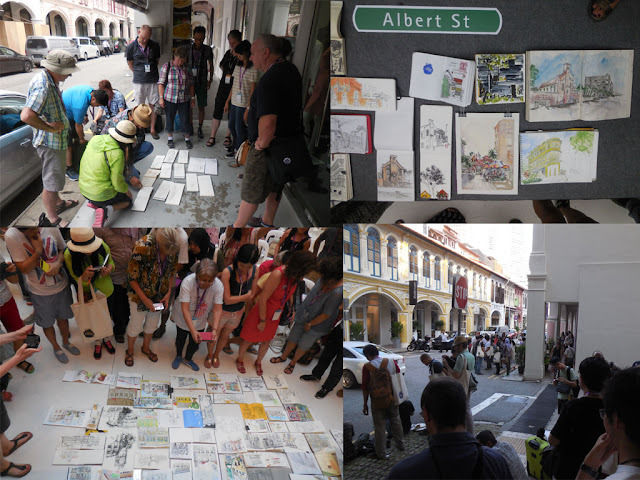 I did not get any photos of us sketching but we did manage to share our sketches. We had a great day. 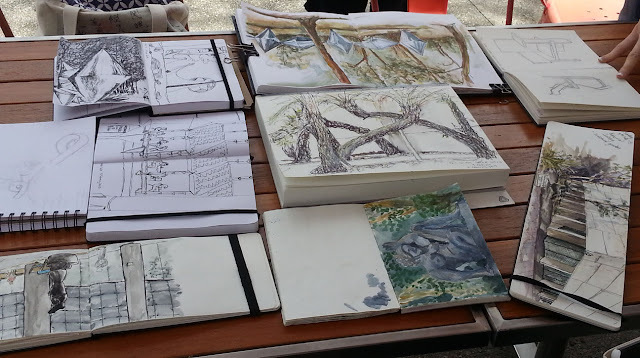 The Canberra Urban Sketchers group meet on the first Sunday of the month and everyone is welcome. 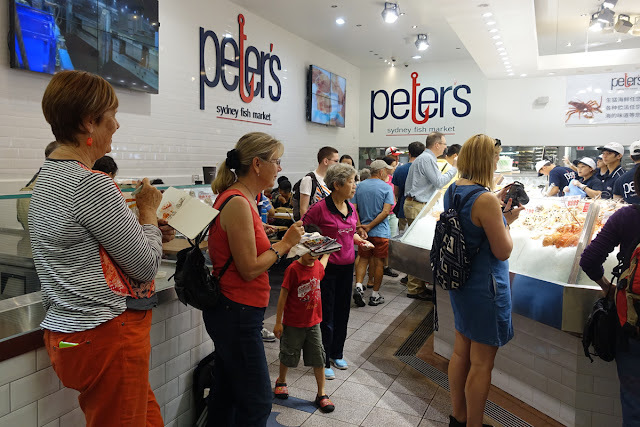 You can see what is happening on our Facebook page or contact us via our email address. 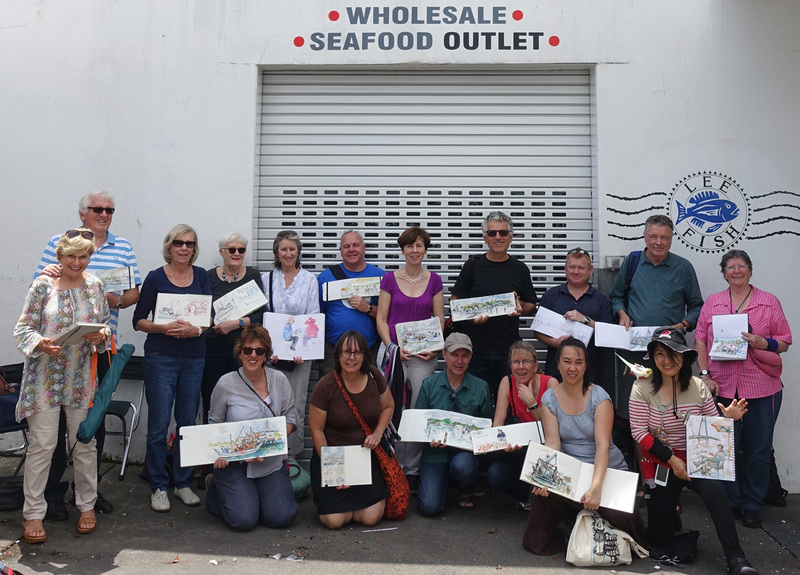 Today about 30 Sydney Urban Sketchers headed to the Sydney Fish Markets. 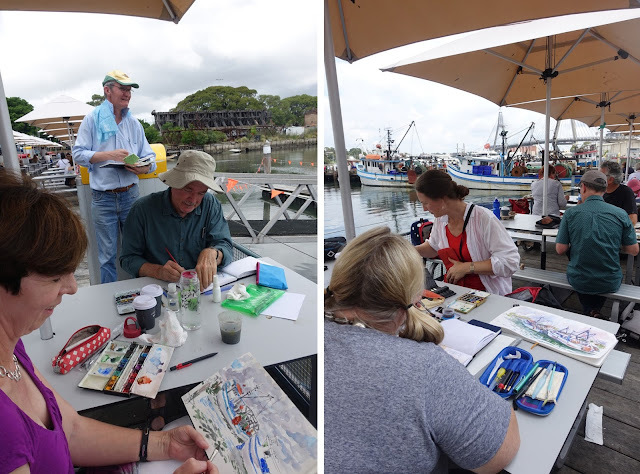 Most people sat outside drawing boats, but a few headed inside to sketch some of the fish! 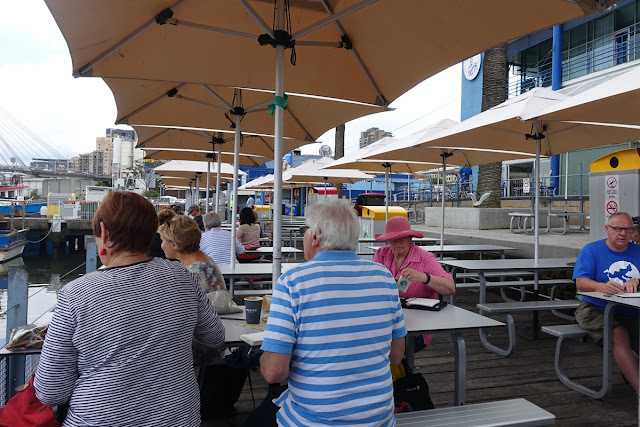 We didn’t get a full group photo as some people stayed at the tables so we had a spot to eat our lunch (yummy fish meals!) as the markets get crazy busy at the middle of the day. A great day - thanks to everyone who was part of it. 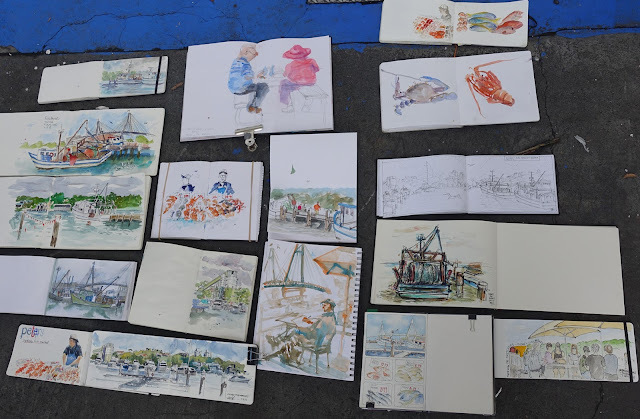 We all had a great day, here are some photos and sketches from the day. Brisbane is looking incredibly beautiful right now with her purple carpet of flowers on the trees and on the ground. It is an amazing sight. 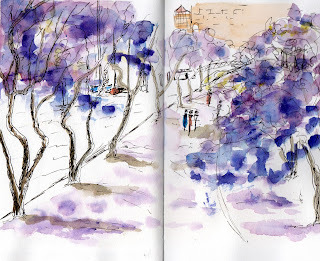 The Brisbane urban Sketchers have been taking advantage of this and sketching in places where the jacarandas are at their best. 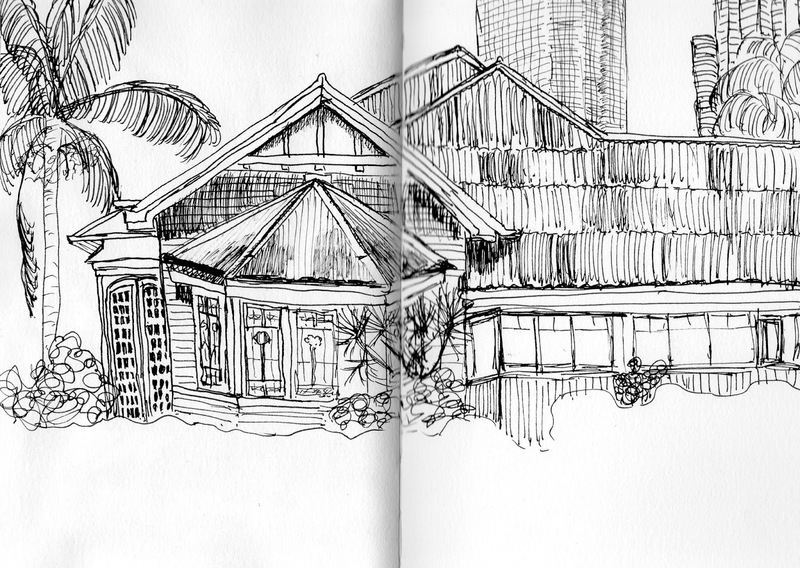 New farm park, UQ St Lucia and Saturday we sketched Dockside. 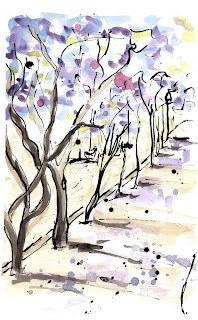 I am sitting with my back to the Iconic Story Bridge looking down the Heritage Walk to the Dockside Ferry Terminal. During Brisbane's convict era stone was quarried at Kangaroo Point for building works in the town across the river. By 1837 parts of Kangaroo Point were being farmed. In 1844 the first of several public houses in Kangaroo Point, the Bush Inn, was licensed. 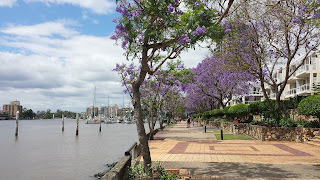 By the late 1850s it is estimated that Kangaroo Point had about 80 houses, a wharf, a ferry service to north Brisbane, a bone shed, the remains of a derelict boiling-down works dating from the 1840s, a sawmill, a brick-works, and a postal receiving box. The industrial potential of Kangaroo Point, particularly along its shoreline, was becoming evident, and all the land had been sold by 1854. 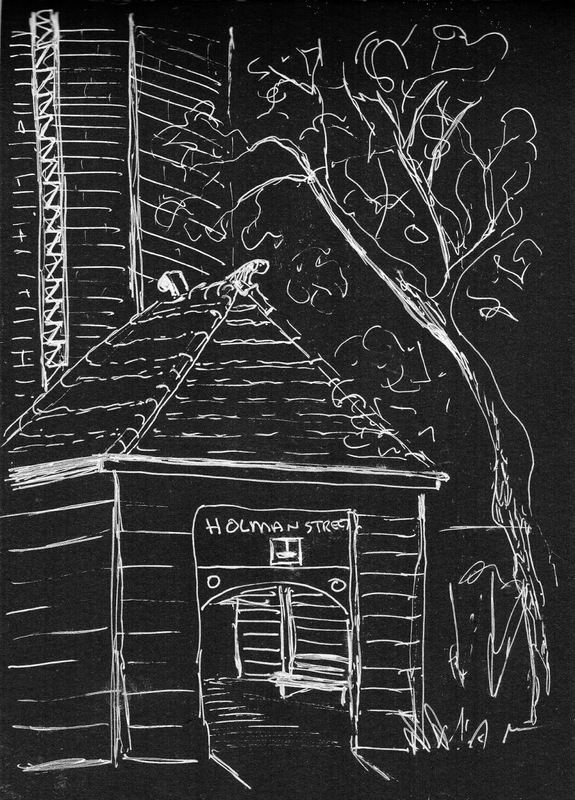 Main Street ran from the tip of Kangaroo Point southward to the Woolloongabba Five Ways. 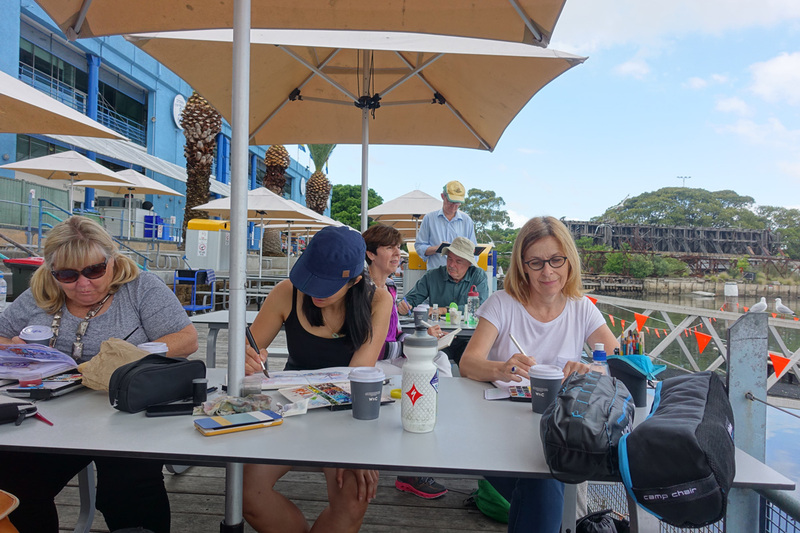 It was flanked by sawmills, tradespeople, cottages, a few larger houses, the Kangaroo Point and Pineapple Hotels, an immigration depot at Wharf Street, the primary school and St Mary's church. Slipways and engineering works were large employers. 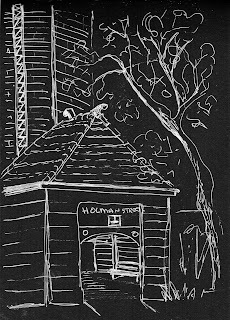 The Holman Street Ferry Terminal was built prior to 1919 for the City of Brisbane, then responsible for the servicing of ferry routes across the Brisbane River. CT White and James Warner Parks at Kangaroo Point were once the home and workplace of some of Queensland's pioneering scientists and researchers. There is now a Natural History Trail here in their honour. I can't wait to go back witht he group to explore and sketch more wonders.